Continuing in the Borderlands series' grand tradition of making sly winks at everything from Minecraft to Game of Thrones to a whole lot of Internet memes, Borderlands: The Pre-Sequel is littered with secrets and references—some especially elaborate. Here are all the ones we know of so far. As ever, beware of the over-9000-eyed spoiler beast from Zarcon VII. 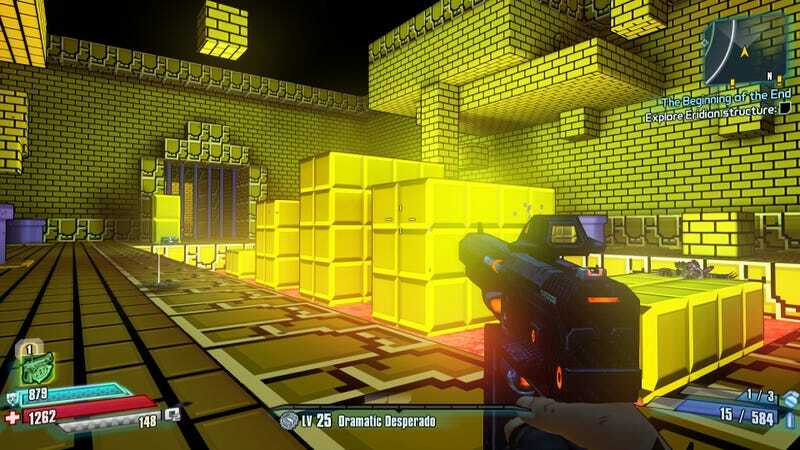 Courtesy of GameFront, here's a look at The Pre-Sequel's hidden Super Mario-themed room, complete with gigantic plumber pipes (albeit purple ones) and pixelated blocks as far as the eye can see. It can be found in the game's final area, as per the video's instructions. Update: Reader James (aka YouTuber JHFLEETING) points out that there's a secret within the secret on this one. He explains, "You can get on top of the wall and skip the second room, getting to a third room with more treasure & warps. Ala the Super Mario warp room you access by getting up on the walls." Via deathmule, here's a video of a quest line—called "No Such Thing As A Free Lunch," itself likely a reference to classic Robert Heilein sci-fi novel The Moon Is A Harsh Mistress—that ends in a brief, bone-splintering encounter with Toy Story's Buzz Lightyear. Or, if not the tiny plastic man who believed he could fly, then a very convincing lookalike. This particular toy story, however, doesn't have the, er, happiest ending. This one might just be the most elaborate of all of The Pre-Sequel's references. In short, if you book it over to Stanton's Liver, you can hop up some cliffs to find a cave with a silently terrifying monolith. If you step in, you'll find yourself on a multi-place, multi-portal odyssey of references to... 2001: A Space Odyssey. I am beginning to suspect there might be some classic sci-fi fans at 2K Australia and Gearbox. They probably won't play Coachella until the Earth is naught but the universe's biggest pile of ash and bone, but Daft Punk is playing the moon right now. Or, well, Pandora's moon—and also they're not really Daft Punk. Still though, as Somewhat Awesome Games points out, the reference here should be pretty obvious. You can find the duo spinning a set in Mad Moxxi's bar in Concordia. It's a Borderlands game set on the moon. What else were you expecting? And actually, it's not just a reference. There's more than one. In a quest called "These Are The Bots," you can hang out with Borderlands-ified versions of R2-D2, C-3PO, Princess Leia, and Obi-Wan Kenobi. Hint: they are all awful people/robots. Meanwhile, if you're a bigger fan of the Star Wars prequels than you are the originals (HAHAHAHA), there's also the option to go pod racing. In this case it's called "pop racing," and also it's... not much like pod racing at all. You get to embarrass the snot right out of a snot-nosed little brat, though, so it's all good in the end. Does the teddy bear hanging out in Mad Moxxi's bar (yes, that happens) strike you as a bit... familiar? Hint: it's because he's Master Chief from Halo, but for some reason tiny, inanimate, and stuffed to the seams with moon fluff. And how about that rad Mjolnir armor, huh? Update: This one might not be a Halo reference, but rather a callback to a similar bear that appeared in Borderlands 2. I've heard it's something of a Gearbox in-joke. This is maybe my favorite mission in all of Borderlands: The Pre-Sequel. A series of obvious references to NBA Jam and the movie Space Jam (no relation) culminate in history's mightiest dunk. Truly, it's a thing of wonder and beauty. Bless you, Dunks Watson. May you forever know peace, perhaps orbiting the Globetrotter Planet. Does anyone still watch Family Guy? Eh, whatever. Anyway, this one gets bonus points for being a parody of a parody. The mission "Kill Meg" (received indirectly from the bounty board) sees you bring down a giant trash compactor tentacle monster known as Meg, a callback to a gag from Family Guy's Star Wars: A New Hope parody episode. If you grew up watching Sesame Street, this one might sting a little. Or maybe it'll bring you a sickening crunch of long-desired catharsis. It all depends on how you feel about Oscar The Grouch, who shows up in Borderlands—where else?—in the trash. If you venture out to Triton Flats you can find him lurking in his own little garbage lair near a moon buggy station. He is rather, er, easily disposed of, as evidenced by ToucansCinema's video. The Pre-Sequel takes place on the moon. A Pink Floyd reference is pretty much obligatory. SemiCrazyNerds point out a bar in Triton Flats called Darksiders, and you might find its towering logo to be a bit... familiar. The "sorry, we're closed" sign is a nice touch, seeing as Pink Floyd is probably never gonna tour again and I'm irreconcilably sad about that. I'll continue updating this post as I come across more references and easter eggs. Feel free to pass along any that you find! Note: This post was updated with new easter eggs on 10/24/2014.